"Three ingredients are all you need for this fun and very quick way to make something for your school-age child's class party or home Halloween party!" Place chocolate chips into a microwave-safe bowl and heat on low in microwave for 1 minute; stir. Continue heating on low several more times, 30 seconds at a time, stirring after each time, until white chocolate is warm and smooth. Use 2 forks to dip cookies into white chocolate; set cookies on sheets of waxed paper. Place 2 miniature chocolate chips onto one end of each cookie for eyes; set cookies aside until coating has hardened, about 20 minutes. I made these. My brother in law is allergic to nuts. So I used E.l. Fudge cookies instead. A big hit at the Halloween party. Will make again. 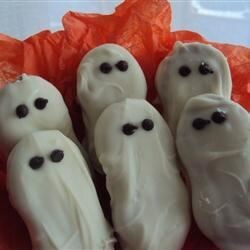 So cute and easy for Halloween. My kids loved them!